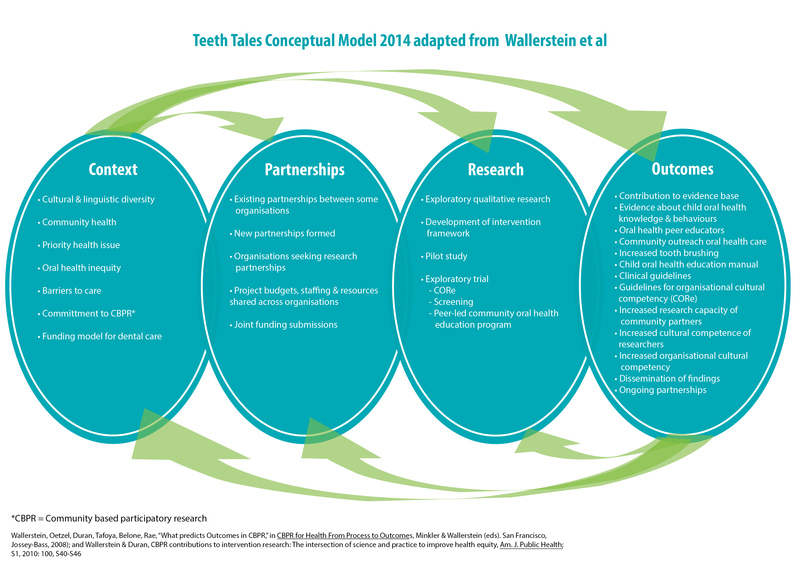 The Engage for Equity study has launched workshops with tools and resources for evaluation and reflection for community based participatory research (CBPR) and Community Engaged Research (CEnR) projects and partnerships. We are now in the intervention phase of our National Institute of Health study and we completed workshops in the Fall, 2017, for those federally-funded projects who filled out our internet surveys in 2016-17 (see below). We have launched our new Engage for Equity website with tools and resources that may be accessed and downloaded. If you are interested in learning more, feel free to email, Nina Wallerstein, at cpr@salud.unm.edu. Our hope is to encourage a national Community of Practice that strengthens our capacities to partner effectively in ways that honor the voice and contributions of all participants, and that best promote knowledge democracy and health equity. For an overview of our project, the study aims, methods and benefits, you can view and download our fact sheet here. The web-based Key Informant Survey (KIS) is completed by the Principal Investigator (PI). This survey features questions related to project-level facts, such as funding, years of partnering, partner member demographics, and so on. For more information for Primary Investigators interested in participating in the KIS survey, click here. The web-based Community Engaged Survey (CES) is completed by the PI and community and academic research partners. This survey includes understanding perceptions of partnering quality, such as trust, power-sharing, governance, and multiple CBPR and health outcomes. For more information for academic and community partners interested in participating in the CES survey, click here. Para más información por los colegas comunitarios e académicos interesados en participar en la Encuesta Comunitaria (CES), haga clic aquí. Based on our previous Research for Improved Health Study (RIH), here are our initial Tools for Partnership Evaluation and Reflection: In the summer of 2017 we will be offering workshops and more resources and tools on the web for self-evaluation and reflection to strengthen your partnership. On April 4th, 2018, UNM MPH student Ellen Burgess presented a poster at the New Mexico Public Health Association Conference. 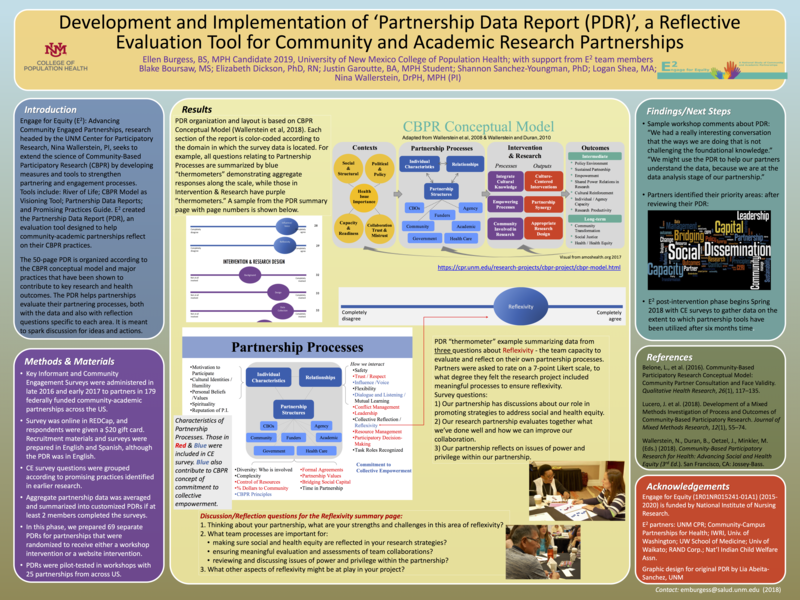 The poster, titled “Development and Implementation of ‘Partnership Data Report (PDR)’, a Reflective Evaluation Tool for Community and Academic Partnerships.” The poster outlines our Engage for Equity research project, while also explaining the Partnership Data Report as well as the future direction of our project. Download the Promising Practices Guide. Download Memorias detailing activities of three Engage for Equity workshops. For more information, contact: Principal Investigator, Nina Wallerstein, nwallerstein@salud.unm.edu; or Shannon Sanchez-Youngman, at the Center for Participatory Research, cpr@salud.unm.edu, or call (505) 925-0715.